When we talk about wool, we almost always mean the fiber from sheep, although the term “wool” can be applied to the hair of other mammals including cashmere and mohair from goats, vicuna, alpaca and camel from animals in the camel family and angora from rabbits. As with many discoveries of early man, anthropologists believe the use of wool came out of the challenge to survive – Neolithic man used pelts from animals to keep warm. Sheep (Ovis aries) were first domesticated 10 000 years ago. The British sought to protect their own wool industry during the eighteenth century, and passed laws requiring native English wool be used – for example, judges, professors, and students were required to wear robes made of English wool. Another law required that the dead be buried in native wool. When the American colonies began to compete with the motherland, the English passed a series of laws in an attempt to protect their “golden fleece.” One law even threatened the amputation of the hand of any colonist caught trying to improve the blood line of American sheep. Today, wool is a global industry, with Australia, Argentina, the United States, and New Zealand serving as the major suppliers of raw wool – but wool is produced worldwide in about 100 countries on half a million farms. Wool producers range from small farmers to large scale grazing operations. While the United States is the largest consumer of wool fabric, Australia is the leading supplier. Australian wool accounts for approximately one-fourth of the world’s production. The annual global output is now estimated at 2.2 billion pounds, yet wool represents less than 5 percent of the world consumption of fibers. Wool is an expensive fiber to produce and process. Though cotton is the number one plant used for fabrics and the number one natural fiber overall, the number one source for animal fiber is still wool. Merino is a term used in the textile industry which has varied meanings: originally it meant wool made from a specific breed of sheep: the Merino. Merino sheep are regarded as having some of the finest and softest wool of any sheep: it is finely crimped and soft, fibers are commonly 65 – 100 mm (2.5 – 4 inches) long and generally less than 24 microns in diameter. But now the term has broader use and may pertain to an article which just contains some percentage of wool from Merino sheep – or even just a fine wool and cotton yarn! The Australian Wool Testing Authority Ltd is trying to institute a definition for Merino wool, citing fiber diameter and comfort factors. The essential feature of a worsted yarn is its long, straight fibers which lie parallel to each other, the result of having been both carded AND combed. So yes, you can have Merino worsted wools! In scientific terms, wool is considered to be a protein called keratin. Its length usually ranges from 1.5 to 15 inches (3.8 to 38 centimeters) depending on the breed of sheep. Fiber diameter ranges from 16 microns in superfine merino wool (similar to cashmere) to more than 40 microns in coarse hairy wools. Wool has several qualities that distinguish it from hair or fur: it is crimped (meaning it has waves), it has a different texture or handle, it is elastic, and it grows in staples (clusters). Each wool fiber is made up of three essential components: the cuticle, the cortex, and the medulla. The cuticle is the outer layer. It is a protective layer of scales arranged like shingles or fish scales. They are sometimes described as little “barbs” because it’s the points of the scales that give wool the reputation for being prickly. 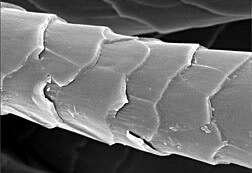 When two fibers come in contact with each other, these scales tend to cling and stick to each other. It’s this physical clinging and sticking that allows wool fibers to be spun into thread so easily. And it’s also what causes the fiber to interlock – or felt. See below for more information on this. The cortex is the inner structure made up of millions of cigar-shaped cortical cells. The arrangement of these cells is responsible for the natural crimp unique to wool fiber. The amount of crimp corresponds to the fineness of the wool fibers. A fine wool like Merino may have up to 100 crimps per inch, while the coarser wools may have as few as 1 to 2. Hair, by contrast, has little if any scales and no crimp, and little ability to bind into yarn. Its wool’s scaling and crimp that make it easier to spin into yarn, because the individual fibers attach to each other, so they stay together. Rarely found in fine wools, the medulla comprises a series of cells (similar to honeycombs) that provide air spaces, giving wool its thermal insulation value. The major steps necessary to process wool from the sheep into yarns are: shearing, cleaning and scouring, grading and sorting, carding. Sheep are usually sheared once a year—usually in the springtime. The fleece recovered from a sheep can weigh between 6 and 18 pounds (2.7 and 8.1 kilograms); as much as possible, the fleece is kept in one piece. While most sheep are still sheared by hand, new technologies have been developed that use computers and sensitive, robot-controlled arms to do the clipping. Grading is the breaking up of the fleece based on overall quality. Wool fibers are judged not only on the basis of their strength but also by their fineness (diameter), length, crimp (waviness) and color. In wool grading, high quality does not always mean high durability. In sorting, the wool is broken up into sections of different quality fibers, from different parts of the body. The best quality of wool comes from the shoulders and sides of the sheep and is used for clothing; the lesser quality comes from the lower legs and is used to make rugs. Scouring in the true sense of the word in the textile industry means simply removing any foreign material from the fabric; the term scour grew up around the washing of cottons and linens. Wool taken directly from the sheep is called “raw” or “greasy” wool. It contains a substantial amount of natural contaminants, such as sand, dirt, grease, and dried sweat (called suint) as well as pesticide residues from the treatment of sheep to prevent disease; the weight of contaminants accounts for about 30 to 70% of the total weight of the fleece. To clean the wool, the fiber is washed in a series of alkaline baths containing water, soap, and soda ash or a similar alkali. 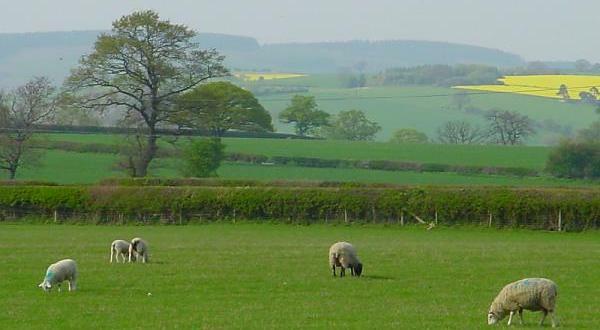 The scouring effluent contains these impurities, which has high levels of COD (chemical oxygen demand) and BOD (biochemical oxygen demand), suspended solids, organic matter and sheep dip chemicals. These levels represent a significant pollution load: the organic effluent from a typical wool-scouring plant is approximately equal to the sewage from a town of 50,000 people. grease – when refined, this is known as lanolin, which is saved and sold for a variety of consumer products. sludge – this needs to be disposed of too: The sludge contains high levels of organic materials such as the potentially toxic sheep dip pesticides (such as organochlorines, organophosphates and synthetic prethroids). In the EU, landfills will now only accept non-recoverable and inert waste. Since the global production of wool sludge is over 930,000 tons, research is being done on the feasibility of disposing of scouring waste by composting, incineration and other methods. The processing stages to this point cause the natural fiber alignment of the scales (or “barbs” as mentioned above) to be completely disrupted; the scales no longer line up “tip to base” as they would in the fleece. Those scales make raw wool itchy and also cause the fiber to shrink when wet. In order to prevent this shrinkage (also called felting), and to make the wool more comfortable when worn next to the skin, many producers use chlorine to “burn” off the scales…this doesn’t entirely remove them, but it does lessen their profile, and then the fibers are coated with a synthetic polymer resin, which essentially glues down the scales. This allows the wool to be machine washed without felting, and gets rid of the shrinkage of the fabric associated with felting. This is the chemistry behind Superwash wool. The tradeoff, of course, is that this chlorination process is highly toxic. See our blog post on Organic Wool to read about the environmental effects of wool scouring and chlorination. It’s not pretty. Next, the fibers are passed through a series of metal teeth. The teeth untangle the fibers and arrange them into a flat sheet called a web. The web is then formed into narrow ropes known as silvers. Carding is one of the processes that untangles the wool fibers and lays them straight; it also removes residual dirt and other matter left in the fibers. Combing is the next process, which removes shorter length fibers and helps to further straighten the fibers and lay them parallel. Combing also helps to clean more debris from the fibers. Have a short staple (1-4 inch long fibers). Are stronger, finer, smoother and harder than woolen yarns. Can absorb almost 30% of its own weight in water – and it can also release it. This makes it breathable and extremely comfortable next to the skin. It can absorb sweat and release it as vapor, keeping you cool and dry. It prevents the clammy, cold feeling you may experience when wearing some types of synthetic clothing and sweating. Is resistant to static electricity, because the moisture retained within the fabric conducts electricity. This is why wool garments are much less likely to spark or cling to the body. The use of wool car seat covers or carpets reduces the risk of a shock when a person touches a grounded object. fabrics have a greater bulk than other textiles because of the crimp, and retain air, which is a great insulation. It keeps you warm when you’re cold, but insulation also works both ways – Bedouins and Tuaregs use wool clothes to keep the heat out. And it does not cling to the skin, allowing for air circulation next to the skin. doesn’t readily catch fire – its ignition point is higher than cotton and some synthetics. Even if it does burn, it burns slowly (not melting or dripping as in synthetics) and self-extinguishes when the source of the flame is removed. It contributes less to toxic gases and smoke than synthetics, and is therefore often specified for high safety environments such as trains and aircraft. has a naturally high UV protection, which is much higher than most synthetics and cotton. is considered by the medical profession to be hypoallergenic. is hydrophilic—it has a strong affinity for water—and therefore is easily dyed.